When Lego revealed its line of EV3 Mindstorms robots last year, Bay Area tech companies came up with some very goofy applications. 12-year-old Santa Clara resident Shubham Banerjee just came up with a decidedly more meaningful one: a braille printer. Banerjee noticed that braille printers can cost more than $2,000 and wondered if he could drop the price, according to his father, Niloy. 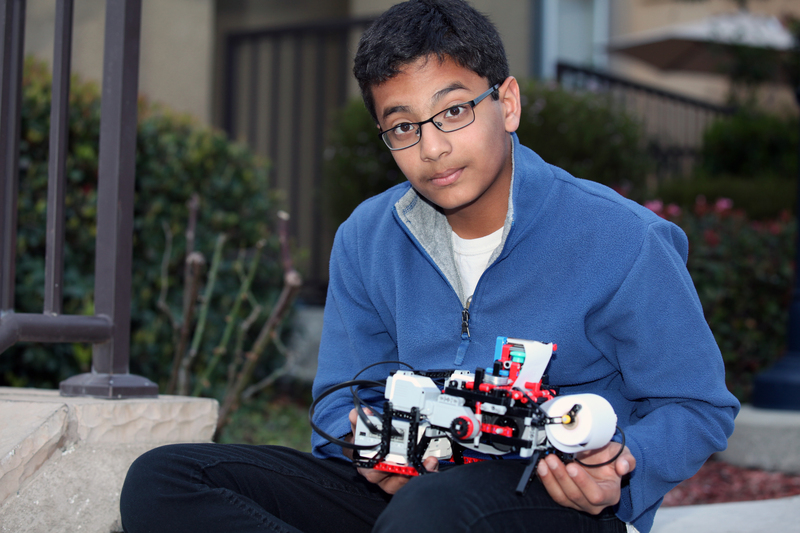 A Mindstorms kit is $350 and easily modifiable, giving Banerjee most of the parts he needed to build the printer. Shubham Banerjee and his braille printer. Photo courtesy of Niloy Banerjee. The printer works with regular calculator paper. A robotic arms moves a module that contains a push pin, which pushes down on the paper to create the bumps that form a letter. Right now, one letter can fit on each line on the paper and each one has to be manually inputted. It can print a letter every five to seven seconds. In the video below, Banerjee prints the word “cat” at the suggestion of his little sister, Anoushka. “Cool!” she responds, upon feeling the braille. Banerjee originally developed the printer for a science fair, but has since expanded his dreams for it. He hopes it can help people in developing nations have easier access to braille printers, which can open up a whole world of expression and interaction. He plans to make the design and Mindstorms program he developed open source for anyone to use, though the printer is still a prototype. Humans are such venomous idiots. Just appreciate what he could do when we were all busy trying ingest tubs of ice cream and move on. i cant beieve half the discussion was on the spelling of legos or its frickin plural or whatever. This is amazing! I can set this up as an stl file and he can 3D print one. It’s Lego. Not Legos. I’ll say it again, and I’ll keep saying it until you idiots get it right. I hope this young boy goes far in life. He certainly has the ability, I hope he also has luck. I really wish we could see the braille printouts better. The video isn’t very good at displaying them. 350 dollars worth of Legos? Soâ€¦ his parents built it then give him all the credit so itâ€™s more newsworthy. Plus now the kid gets free academic attention because they think heâ€™s an engineer.. Someone better call the jelly school, cause we got someone who is super jelly over here! nacs – seems like you know the parents or know the ability of the kid ? Actually I live in Santa Clara and participated in many of their school science fairs, this started out as one. There are a lot of requirements, including doing the project yourself and sometimes building the experiment on campus. The interviews by the judges are intense and test your knowledge of your experiment. I had a judge mark me down in the eighth grade because my mom lit the candle for my experiment. I was not allowed to use matches or a lighter so I didn’t have much of a choice, but I got marked down all the same. I guess you guys are having a hard time spelling out his name. My apologies. The post has been updated with the correct spelling. I will never, ever, EVER accept this despite hearing it from experts. I don’t really care what the creator of LEGO interlocking bricks thinks the plural form is, saying “I have 500 Lego” sounds absolutely stupid. Correctly, you would say “I have 500 Lego bricks”, but since the brand name is now almost synonymous with “interlocking toy bricks”, the plural of lego (referring to the brick) is legos. If you have more than one Audi, don’t you have multiple Audis? The answer is yes! The only reason that LEGO (the company) doesn’t want you calling their product “legos” is because they are trying to protect their trademark (and are extremely paranoid about it). You don’t see these arguments pop-up about calling multiple cans of Diet Coke Diet Cokes, multiple iPods, multiple Rolexes, even though they are all acceptable in daily speaking. You don’t get to claim complete control over the way the English language works just because you want to protect your trademark. Correct, trademark control is no complete authority on word use, especially since the company will probably say anything in order to not offend an entire market. However Lego is a commodity, not a group of objects. The reason Lego is the plural and not LegoS is because people don’t usually COUNT their 500 Lego bricks. There’s usually too many. Because of the sheer volume of bricks, the toy is referred to en mass – like sand. Do you refer to a handful of sand as sands? No, because although there are a finite number of grains of sand, it’s not as often counted as referred to en mass. Instead sandS refers to different types of sand, and LegoS refers to different types of Lego (eg; harry potter themed, technic, etc). It just depends on the word. What is your house made of? Brick. But I am going to need more bricks to build that house. So by your logic, if they included the word brick in the article title, it would say “$350 worth of Lego brick” because of the sheer volume? No. The guy above you has it right.